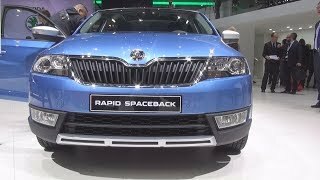 Skoda brings Skoda Rapid Spaceback Scoutline 2016 which is completely youthful, adventurously styled compact car. Two years ago, the SKODA Rapid Spaceback became the first SKODA hatchback model in the high-volume compact segment. With this success now it’s the time of the model Rapid Spaceback Scoutline to blow up the market with its launching. It has a dynamic and a fresh design combined with practical SKODA qualities. Let us have a close look at the reviews of the Skoda Rapid Spaceback Scoutline 2016 and get to know more about the hilarious model. Skoda Rapid Spaceback Scoutline 2016 is enhanced with adorable interior. It focuses on a clear, distinct appearance - with particular style. Rapid Spaceback Scoutline comes with a sporty and fresh feel, which is dynamic, elegant, attractive and appealing at first glance. It provides top-level safety, unique customizable features, low consumption and excellent value for money. The Rapid Spaceback offers the largest knee room (65 mm) and the largest rear headroom (980 mm) in its segment. The boot capacity totals 415 liters or 1,381 liters with the rear seats folded down, which is amongst the best in the segment. Rapid Spaceback has a false boot floor as an optional extra. With this feature, the boot can be divided into two horizontal compartments to make it twice as useful. In addition, there is an ice scraper in the fuel filler cap, a high-vis vest holder under the driver's seat, a double-sided boot liner and a waste bin in the side door. The exterior of Skoda Rapid Spaceback Scoutline 2016 is as sporty and elongated. This distinguishes the car from its competitors in terms of looks and functionality. The model's exterior dimensions measure 18 cm shorter than the Rapid hatchback. It has active safety functions are optional xenon headlights, tire pressure monitoring, front fog lights with corner light function and Hill-Hold Control. In addition it is aided with features like a rugged outdoor look, distinctive plastic panelling, 16- or 17-inch alloy wheels and further design elements. The front and rear bumpers have striking panels in matt black and Reflex Silver (middle section). The protective plastic side panels around the sills and wheel arches are also matt black. The Skoda Rapid Spaceback Scoutline 2016 comes with a dynamic and fresh design, combined with practical ŠKODA qualities, appeals to a younger customer group. 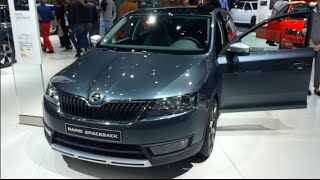 Skoda Rapid Spaceback Scoutline 2016 is available with any of the engines offered for the entry-level model. There is a choice of three petrol 88 hp. 108 hp and 123 hp and two diesel engines 88 hp and 114 hp. All powertrains comply with the new EU6 emission standards and all come with the stop-start function as well as brake energy recovery. The package also includes silver 16-inch alloy wheels in the 'Rock' design or 17-inch wheels in the 'Camelot' design.